The DOJ Reached an Agreement with Clinton Lawyers to Block FBI Access to Clinton Foundation Emails! Strzok defends his affair with Page, claims it wasn't a cause for coercion. 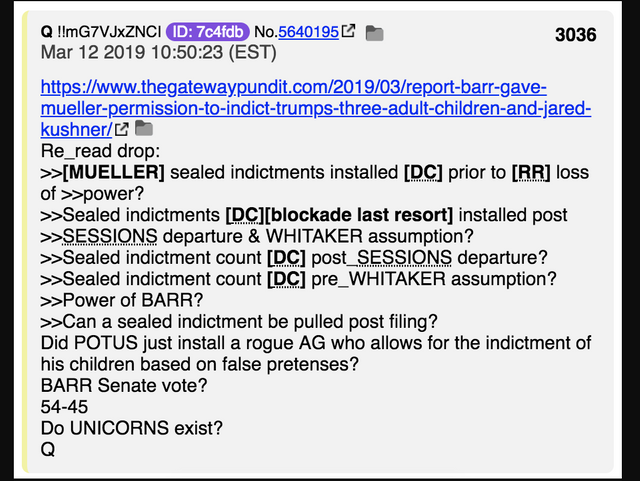 Qanon Connections. 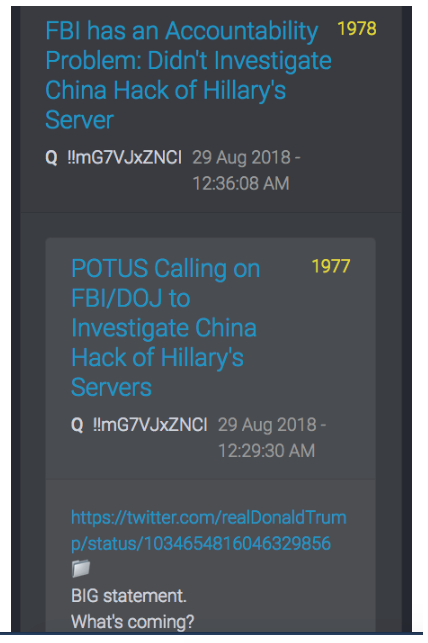 Latest Qanon drops remind us that the DOJ reached an agreement with Clinton Lawyers to block FBI access to Clinton Foundation emails. "negotiated" an agreement with Hillary Clinton's legal team that ensured the FBI did not have access to emails on her private servers relating to the Clinton Foundation, former FBI special agent Peter Strzok testified during a closed-door appearance before the House Judiciary Committee last summer. 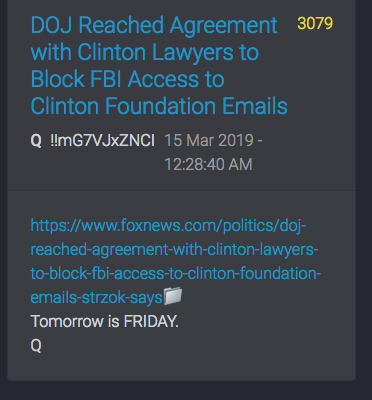 Although the FBI eventually took possession of the servers, Strzok continued, the possession was "based upon the negotiation of Department of Justice attorneys for consent." "A significant filter team" was employed at the FBI, Strzok said, to "work through the various terms of the various consent agreements." Limitations imposed on agents' searches included date ranges, and names of domains and people, Strzok said, among other categories. 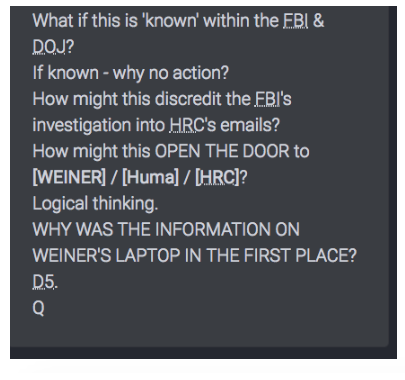 But Strzok later said that agents had access to the "entire universe" of information on the servers when using search terms to probe their contents. 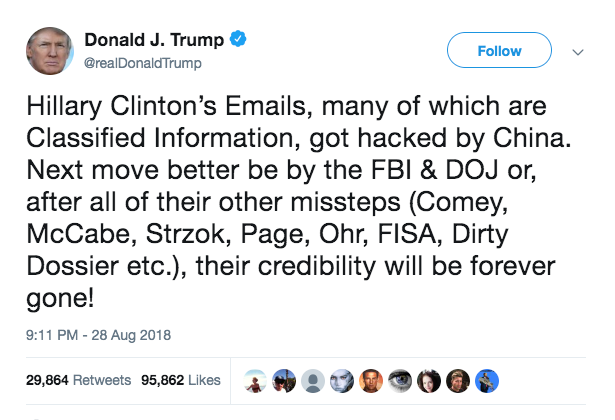 He also told Somers that "we had it voluntarily," although it was unclear if he meant all emails on the servers -- including ones related to the Clinton Foundation. "What's bizarre about this, is in any other situation, there's no possible way they would allow the potential perpetrator to self-select what the FBI gets to see," Chaffetz said, noting that the FBI was aware that the servers contained classified information in unclassified settings. "The FBI should be the one to sort through those emails -- not the Clinton attorneys." 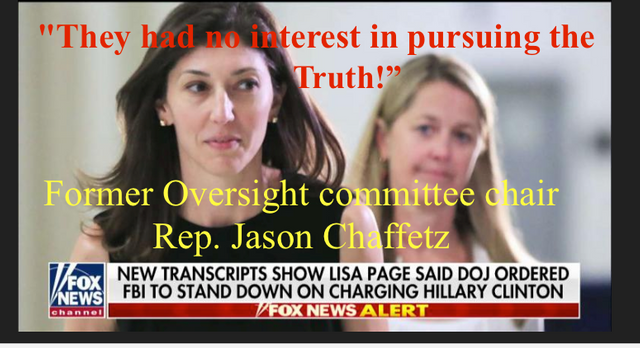 The DOJ's goal, Chaffetz said, was to "make sure they hear no evil, see no evil -- they had no interest in pursuing the truth." What Chaffetz states rings true to findings when pouring over some of the info contained in some of those emails along with how they were handled. You can see the proper protocol was Not used by Hillary. The scope of the Hillary Clinton email investigation was so private, the OIG didn't have the security clearances needed to view the emails. Yet she Forced others to allow her Access where non secure! What's Wrong with this Picture? Chaffetz added that the DOJ's behavior, including its award of immunity to top Clinton aides early on in the investigation, signaled a clear double standard: "They didn't go make a deal with anyone in Trump's orbit. They seized it. 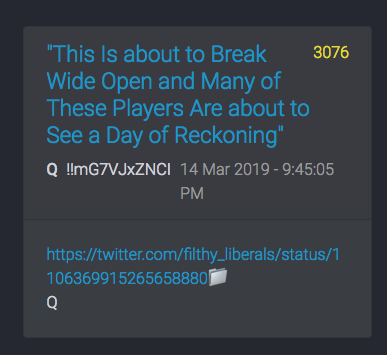 They used guns and agents -- and just went in there and took it." "The Clinton Foundation isn't supposed to be communicating with the State Department anyway," Chaffetz continued. "The foundation -- with her name on it -- is not supposed to be communicating with the senior officials at the State Department." The Clinton Foundation did not respond to Fox News' request for comment. Separately in the closed-door session, Strzok defended his affair with Page, repeatedly denying that the relationship presented a security risk when challenged by GOP aides. This is different from the story yesterday, which was that Mueller would ‘make the case for collusion’. It is different from what the former CIA director, John Brennan, said on Lawrence O’Donnell’s show on MSNBC this week. 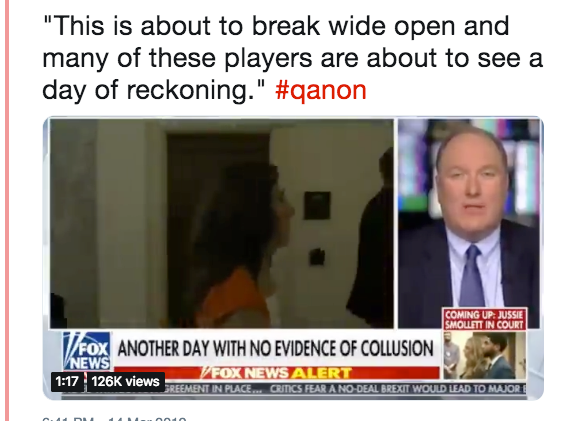 He thought that the children would be indicted and (like Cockburn) that it would happen on Friday.